PAUL BISHOP ~ WRITER: PULP NOW: CUTTER'S LAW! Pro Se Productions, a leader in Genre Fiction, announces the debut of yet another action packed series as a part of its Pro Se Single Shot Signature imprint. The Single Shot Signatures are recurring series or writers’ imprints that focus on digitl single short stories released on a set schedule. 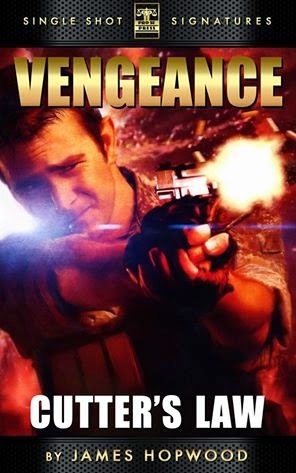 Author David Hopwood takes readers back to the adrenaline fueled, pulpy tales of adventure and danger with his series, Vengeance and the debut tale- Cutter’s Law! Scribed by James Hopwood (pen name of rising pulp adventure writer David J. Foster), the series features Nathan Cutter, an Australian soldier whose life is turned upside down when his family become innocent victims in a gangland war. Written in the style of the men’s action-adventure stories of the 1970s and ’80s, such as The Executioner, these fast-paced stories ratchet mayhem and excitement to new levels. Cutter was first launched on the unsuspecting public in Matt Hilton’s Action: Pulse Pounding Tales in 2012 and 2013. Now he is back, in new expanded editions of the original tales, plus an explosive new story – never before published.